First off, for those of you who were interested in using the 30% discount on last week’s Oak Leaf lamp, it looks like it’s back in stock! I’m still working with the company to see about offering a giveaway as well, so I will let you know as soon as I get the details worked out. I’ve been teaching fitness classes for almost a year now (wow, seriously?). Many of the people who come to my classes are regulars and are familiar with many of the movements, structures, and locations of equipment around the studio. With the explosion of ClassPass in Chicago and many cities around the country, however, people are now able to sample a variety of classes every month. You may see them only once or twice a month (ClassPass allows three trips to the same studio per month), which isn’t much time for them to become a known face or get as comfortable with the format of the class. 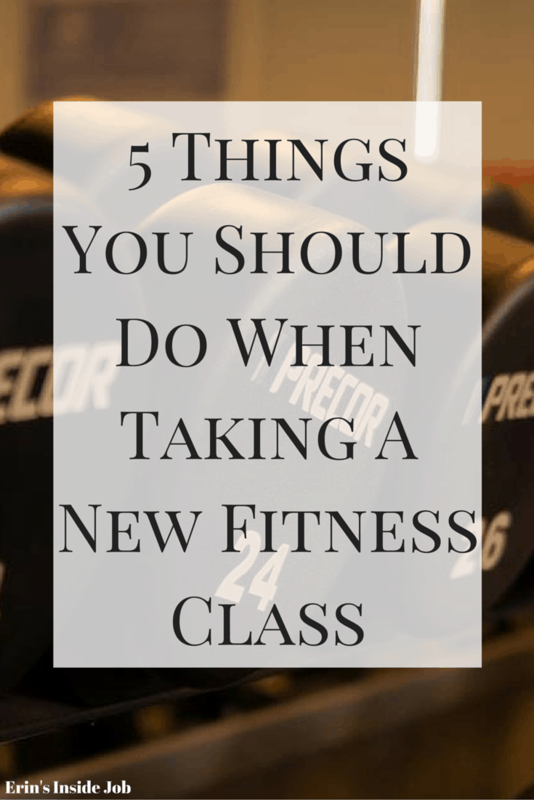 Based on my experience teaching AND sampling a variety of classes around the city, I’ve come up with a list of the five things you should do when taking a new fitness class. Some days I only have one new person in class and it is easy for me remember their name and face. Other days I can have anywhere from 5-10, which makes it much harder to figure out who is new and pay them that extra amount of attention. Taking a new class can be intimidating and you may feel compelled to shrink into the background. DO NOT DO THIS. Find the instructor, introduce yourself, and let him or her know that this is your first time. The instructor’s job is to go into a little more detail with you about what will be going on and point you in the direction of any equipment you may need. By introducing yourself, you give the instructor the ability to focus on you during class and let you know if anything needs correcting or just offer you extra encouragement during your first time. Not all fitness classes are the same, but there will always be modifications to movements. If you see a movement that seems too difficult for you, ask the instructor for a modification. You may be tempted to push yourself past what you are capable of doing just to make it seem like it’s not your first time, but it’s far more important for you to get a proper workout for your fitness level than to potentially hurt yourself. Just because you are injured doesn’t mean you can’t get your workout on (injury depending). I have had a number of people come up to me before class and let me know that they are having shoulder issues, can’t squat, or whatever other limitation they may have. Discussing this with your instructor beforehand allows the two of you to come up with alternative movements or modifications so that you can still get an effective workout. If something doesn’t make sense to you, ask questions! I know it sounds easier than it is in a large group of people, but it’s crucial to you getting the best workout you can. Where I work, all of the movements are demonstrated before the workout begins, which allows people to ask questions if something wasn’t explained correctly or they simply don’t understand a movement. Anything, anything at all that you’re not clear about, just ask. I promise your instructor will not bite. If you are brand new to a certain workout, it is likely that some movements or formats may be more difficult for you than for someone who comes regularly. Don’t be afraid to slow down, take a quick break, or drop down in weight if you find yourself struggling. Always push yourself to do the best job you can, but be realistic about what that actually means. Do you do any of these before taking a new class? Is there anything else I left off the list? How often do you try new classes? These are great tips. As an instructor, I always ask if anybody is new (if I can’t recognize a face) and try to be really non-intimidating about making the class more comfortable for newbies. I agree completely that introducing yourself and giving the instructor details about yourself is important for getting the most out of the class. It’s easy to just fade into the background, but then you’re just cheating yourself out of the full experience. Erin@BeetsPerMinute recently posted…Do You Give Yourself Ultimatums? Totally. I can’t say that I always introduce myself to the instructor but I know I love it when they do it to me! I can’t say I have ever introduced myself to a fitness instructor, and honestly I probably never will. I will ask questions after class if I didn’t understand a move though. These are great tips Erin! I have to admit that one of the reasons I don’t like fitness classes is because I need a lot of modifications and despite that I know how to do them, it still turns me off. I mean you’re in the middle of a class what are you going to do? Yell to the instructor who’s at the front of the room for a modification? It’s embarrassing! So I avoid it altogether. This is why I’m going after my personal training certification right now because I think there are many people like me who are middle aged with issues and don’t know how to workout and the classes are too intimidating for them. Thanks Megan! Most people I know who have chronic issues just kind of do their own thing or let me know that they may change a movement during the workout. I love that reason for why you’re getting certified. You’re gonna rock it! YES to going at your own pace and not being afraid to modify!! It’s easy to feel like you have to keep up with other people/the instructor, but it’s not worth the injury! I wish more people understood that and made sure to just do the best job they could! I was new in a barre class the instructor picked on me THE WHOLE TIME. It was the worst class ever. I’m all for being helped and corrected because I know I’m not an expert but she went a little too far. I never went back for another barre class because of it. I try to introduce myself as much as possible.. I’m one of those people who loves encouragement during class so I like te instructor knowing my name! Definitely a great point. It’s hard to do these if you’re not used to it. I promise though we won’t bite! We just want to make sure you have the best experience you can! Great tips Erin! Especially for anyone new to group fitness. These are such great tips! I teach classes as well and I always like to tell people to go at their own pace, especially if they are new. I think sometimes people try to do more than they are ready for with classes, so I love that you shared this tips! I just want to make sure that people know to do the best job they can FOR THEM and not feel the need to impress other people or push too hard! Great! If you want to do it, go for it. It’s about what YOU want to do. I hope you have a great time!